After the failure of the last great German offensive in the western front in 1918, it was clear that Germany would lose the war. Because of the war and the Allied blockade, many Germans were on the verge of starvation. There were waves of strikes and communists and socialists were actively demonstrating against the government. The German Field Marshal Ludendorff, who had effectively been the military dictator of Germany was dismissed, and the Imperial government sought to make peace with the allies. As the government was negotiating peace terms with the Allies, a revolution broke out in German. 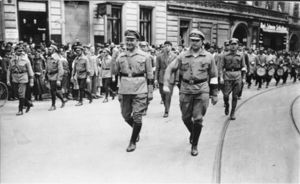 Workers went on strike and established committees that seized control of many urban centers. In response, the Social Democrat leader Erbert demanded to become Chancellor of Germany. He and others declared the Weimar Republic in November 1918. Soon after elections were held and the Social Democrats formed the first government. The Constitution of the Weimar Republic established it as a ‘presidential republic. 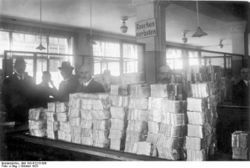 Despite the hyperinflation and extremist violence, the Weimar Republic survived, and democratically elected governments were able to make significant changes to the German economy and society. Able politicians like Gustave Stresemann were able to secure changes to the financial clauses of the Versailles Treaty, and this helped the economy to improve. 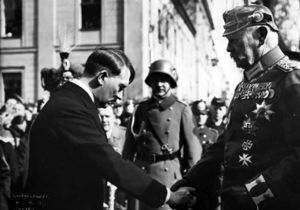 He was also able to secure loans from the United States to help Germany recover from the war and hyperinflation. ↑ ,Weitz, Eric D. (2007). Weimar Germany: Promise and Tragedy. Princeton: Princeton University Press, p.17.